Yes it's true, we took a stock 330 HP Jet boat engine, bored it to 467 cubic inches (.060 over), beefed up the bottom end with 4-bolt mains, forged crank, good rods. Increased the compression ratio to 10.5 to 1. Added a set of AFR heads, roller cam, single plane manifold with a 1250 Carburetor. Then of course, a set of Lightning 2" headers. 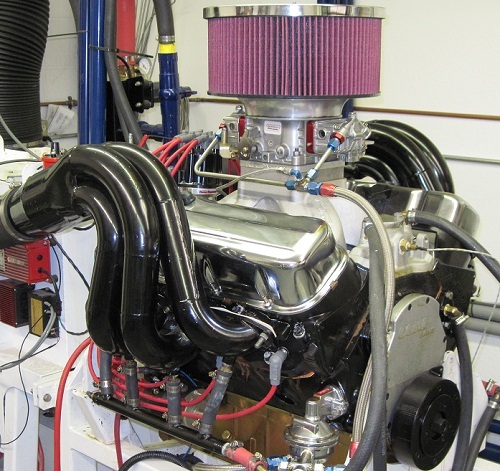 We put this bad boy on our in-house Dyno and banged out 712 HP @ 6800 RPM, on pump gas. 1. Application. Will this combination work in my boat? Don't get caught up in looking for big horsepower numbers. In fact, horsepower numbers in regards to boats are pretty useless. Boat engines run in a stall condition. They run up to a particular RPM and then stall. Torque numbers are a more accurate way of measuring the output of a marine engine. THE ONLY THING HORSEPOWER FIGURES ARE GOOD FOR IN THE WORLD OF BOATS IS BRAGGING RIGHTS. 2. Camshaft selection. When selecting a camshaft, you have to take many things into consideration. At what RPM do I want the power to come in? What type of Header? Wet or Dry? Noise? Many states now want to see water coming out of your exhaust tips. The day of the dry tailpipe is coming to an end. Wet headers have significant muffling effect. Maintenance? The more aggressive the cam, the more maintenance involved. 5252 is the constant. Below 5252 RPM Torque numbers are higher than Horsepower numbers. Above 5252 RPM Horsepower numbers are higher than Torque numbers. For the history of the term Horsepower and why we use 5252, click here. Lets face it. The automotive engine does not like water in the exhaust. Add big cubic inches, a large overlap camshaft, wet exhaust; and the problem only gets worse. If you use an automotive style camshaft to build your marine engine, you're in for trouble. The automotive camshaft does not take into account the presence of water in the exhaust. If you use a automotive style camshaft with a duration greater than 220@.050, the engine will pull water back from the exhaust, making your engine a 8 cylinder water pump. Our marine camshafts are specially designed around wet exhaust. With custom designed valve timing event camshafts and specialty variable duration lifters that are available in flat and roller tappet designs. With camshaft durations from mild ( 220 @ .050/.500 lift ) to wild (270 @ .05/ .800 lift ). If you are determined to use a automotive style camshaft click here.